I have a very-quickly-knitted jumper. 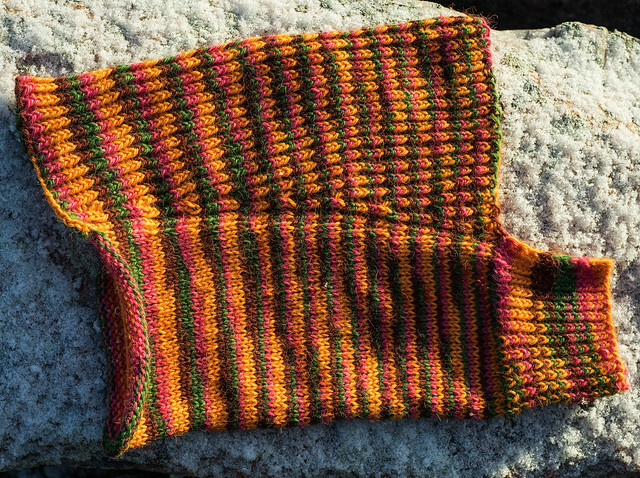 For once it’s a jumper that I started recently, and finished in just a couple of weeks. So no procrastinating here for a change. The yarn, however, I’ve had for some years now. I’m trying to use up my stash and a lot of the yarn I have is at least a few years old (and some even a few decades). This yarn is called Novita Rose Mohair. 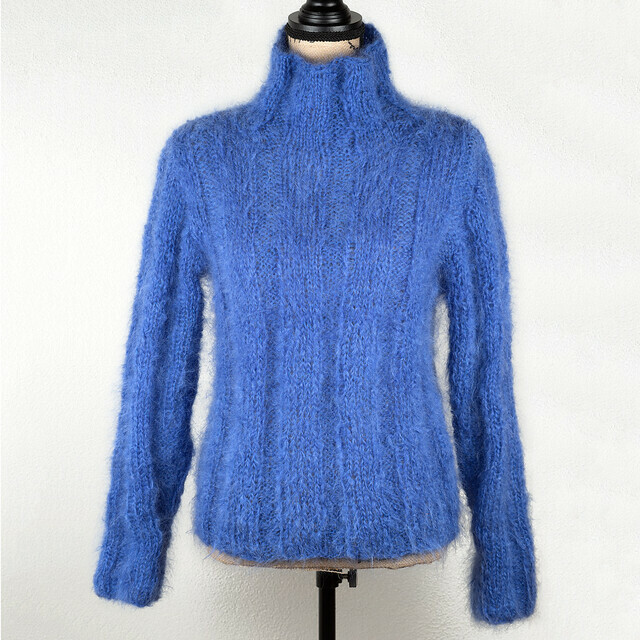 It’s 65% acrylic and 35% mohair. It’s obviously not the warmest of yarns/jumpers, but right now, as it’s not so cold (it’s been close to zero degrees C, or even above), it’s ideal. The pattern is by Novita, too. I only changed the striping a bit. I’m very pleased with the jumper. I wasn’t 100% sure I would like it when I was knitting it, but I do. There’s enough positive ease to make it very comfortable and it’s also very light. It only weighs 230g. At the moment it’s perfect with a long-sleeve t-shirt. Oh no, another hat! But also a matching cowl. I’ve had this lovely Artesano 100% Alpaca yarn for a few years just waiting for the right project to come along. Then I spotted the Structured Alpaca Cowl and knew this is it. The picture is from a funny angle and the cowl looks a bit like a dog’s jumper but trust me, it’s a cowl. It’s a very nice cowl. I knitted the hat with the leftover yarn. It’s such a nice and soft yarn that I didn’t want to leave any left over. I don’t have a pattern for the hat – I just winged it. 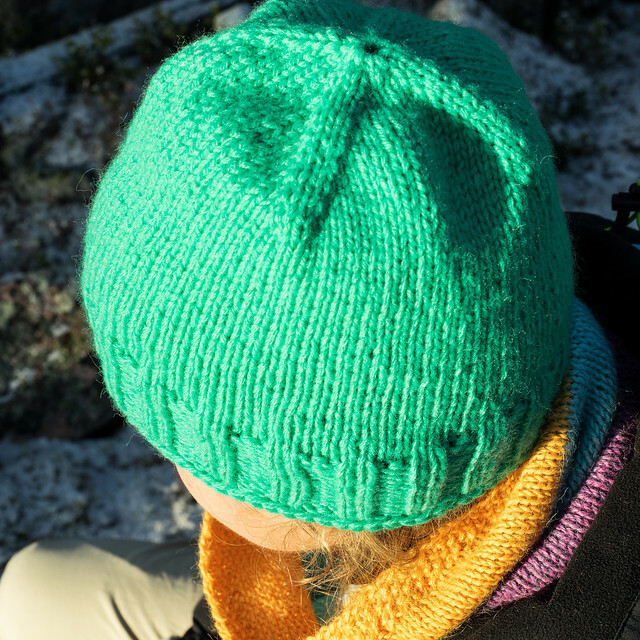 It’s a top-down hat, which is great when you want to use up all of the yarn. I like the way the pattern is formed on the hat. First it’s thin stripes on the crown and then they turn into thicker, irregular stripey shapes. The hat and the cowl work nicely together. I like how half of the cowl is rib. It can be lifted up to cover the neck completely from evil cold winds in the winter. There is also a little flap on the front to keep the chest nice and warm. Technically, this set is good enough to rob a bank! Not that I would, but, you know, in theory. I have another finished jumper. It’s another one that needs a bit of an explanation. Unlike the Viking Knot jumper, this one didn’t take 11 years to knit but it wasn’t exactly a quick one either. In fact, I knitted it a few years ago but I really, really didn’t like it at all. The sleeves were too long – and I mean monkey-long – and I’m sure I had followed the pattern. Also, I ran out of yarn and couldn’t knit the collar high enough and it looked really stupid so short. I had bought the yarn, Drops Vienna, in a sale. I figured mohair would be really warm. I don’t know if it’s the case, but I assume lots of air is trapped between all those long fibers making it warm. That’s the reason I bought the yarn. 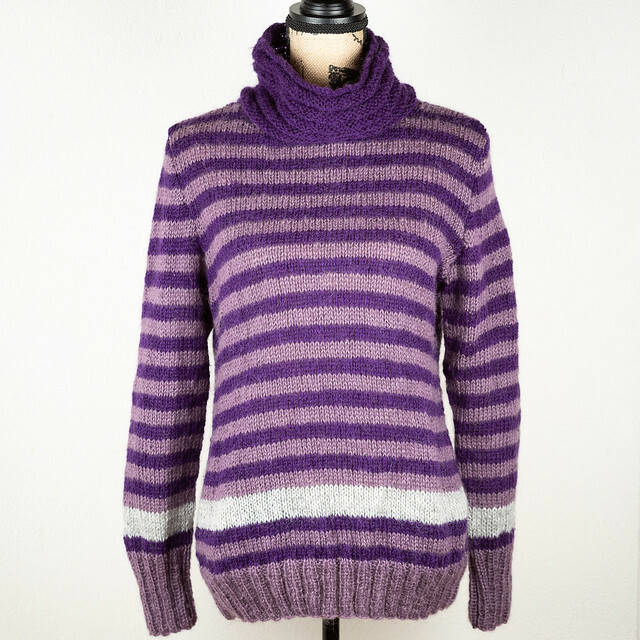 Of course it was discontinued by the time I finished the jumper the first time round and I couldn’t get anymore to knit a higher collar. With the monkey sleeves and the world’s stupidest short collar, the jumper ended up to the back of the wardrobe. I didn’t know what to do because I knew that mohair is notoriously difficult to frog. A couple of years passed and in that time I grew a spine! The sleeves had to be tackled one way or another. And what did I know? It wasn’t that difficult to frog. It only stuck a bit on the edges of a row and with the help of a large tapestry needle, I managed to get all the tangles out. 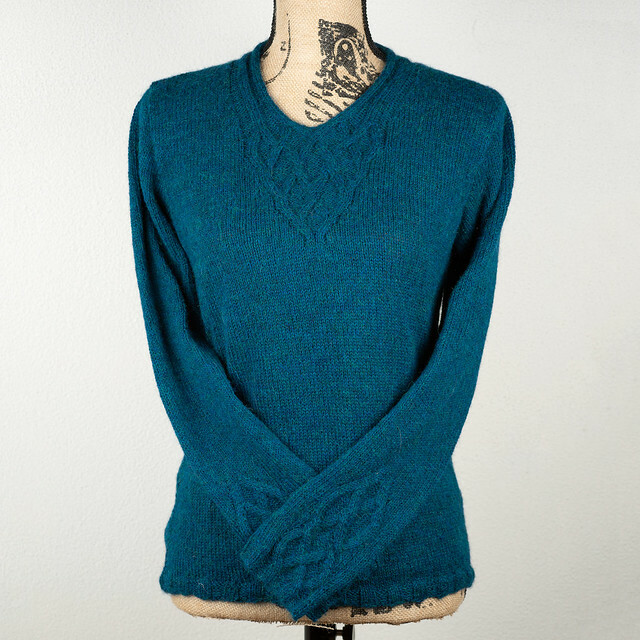 I shortened the sleeves and with the extra yarn, I could knit the collar higher. Now I’m happy with the jumper! Question is, why do I always procrastinate? It took me one afternoon and a bit of another to fix the jumper. It took me a couple of years to pluck up the courage. Well, better late than never, I guess. The pattern is also by Drops Design, 80-1. My collar is a little bit shorter than in the pattern, as are my sleeves. Maybe I have really, really tiny short arms. I’ve not noticed that before but it’s good to know. Oh, and on a side note, remember the Arctic Wookiee (also known as a muppet or Cookie Monster)? I have a hat and a cowl with that same blue mitten yarn. Now this jumper. All I need now is blue socks and pants and I have an entire frozen Arctic Wookiee outfit! Awesome, right? Did you know, that the original Chewbacca outfit was handknitted with yak and mohair yarn? Yes, that’s a fact. I bet the designer is a bit annoyed now having not made the Wookiee blue. I live in the municipal of Sodankylä (since 2006), which is located in Finnish Lapland. The municipal is large in area but small in terms of population. The two official languages of Sodankylä are Finnish and Northern Sami. It’s extreme northern location means short summers and long, cold winters. For a knitter, that’s kind of ideal. 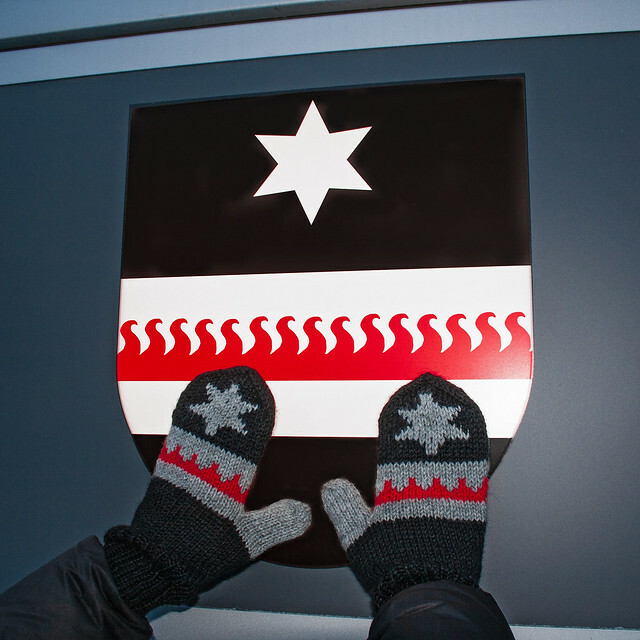 The coat of arms of Sodankylä is really cool. I like the colours black, silver and red and the very graphic design. It’s said to symbolise the Lappish wilderness. 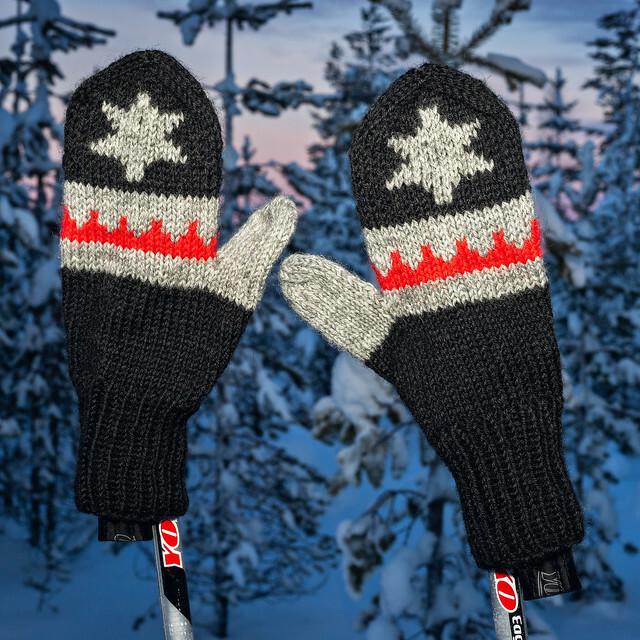 The black means the long, dark polar nights and the red flames are from a type of open fire, where the fire burns in a crack between two large logs. Because of the star (which can be seen during the dark long nights in the winter), Sodankylä is called the star municipal of Lapland. 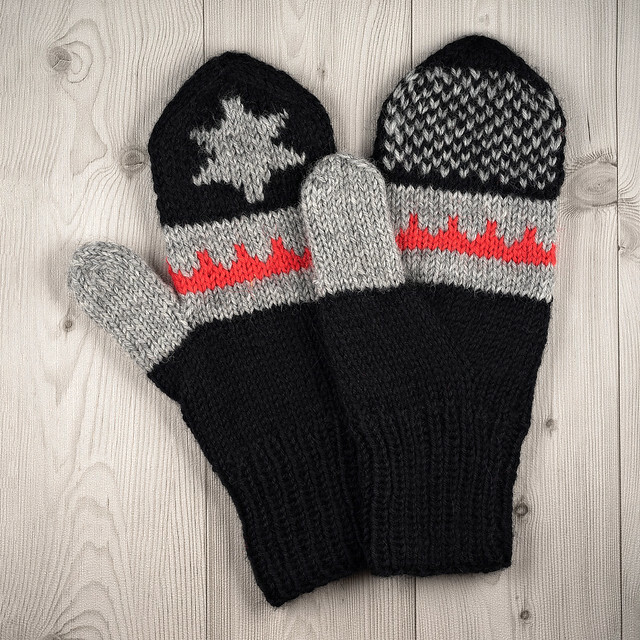 I wanted to turn this cool design into mittens. I stylised the camp fire by knitting it without the squiggle. On the palm side I knitted a dotted starry night pattern – I thought that would be appropriate. 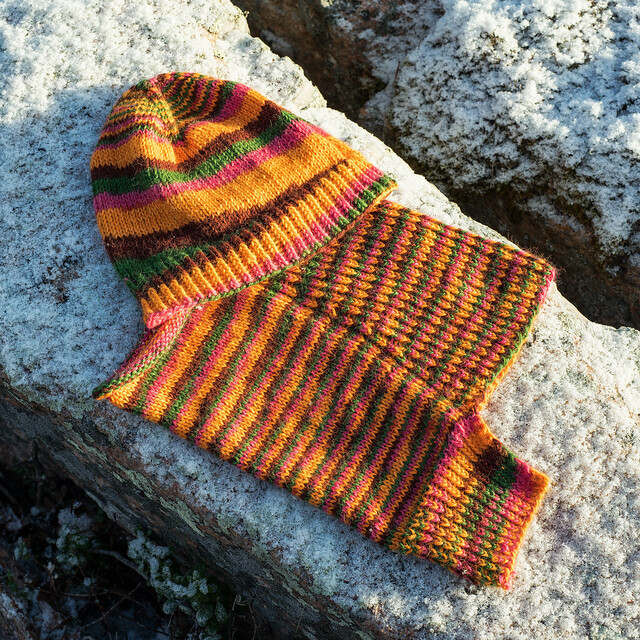 I used Novita 7 Veljestä yarn, which is nice and fairly thick, so it makes warm mittens. This last picture was taken in the middle of the day. Around the polar night time (in December), daytime is short and very blue. I like using my ski poles for photo props. Yet another hat! 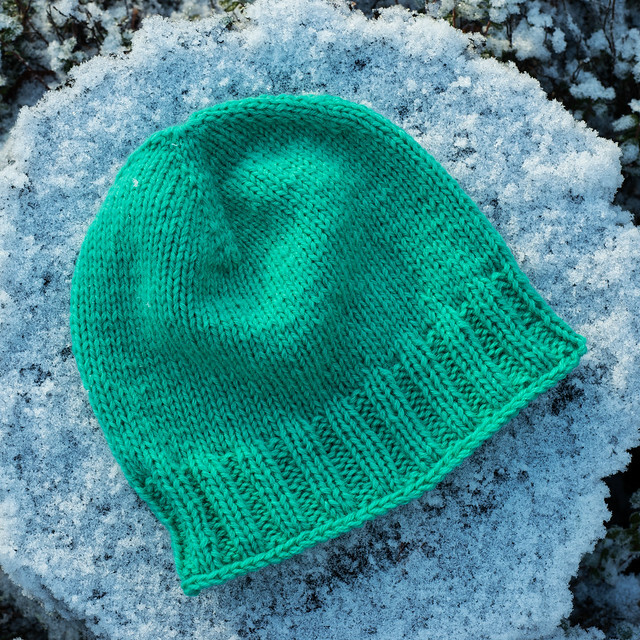 I had to knit this hat because I found a small ball of this green yarn and simply had to get rid of it. The yarn is Sirdar Country Style for Kids. I bought the whole packet (a kilo I guess) a long time ago. It was a good offer and I was a student at the time – say no more. Over the years I’ve been knitting and knitting and this never-ending yarn just – well, never ends. Until now. I’ve knitted a cardigan, a bolero, mittens, fingerless gloves, a scarf and now a hat with this yarn. Maybe something else too. The yarn is 45% acrylic, 40% nylon and 15% wool. It’s clearly not a very warm yarn but it’s easy to care for. Just throw the knit in the washer and it comes out the same as you threw it in, only cleaner. 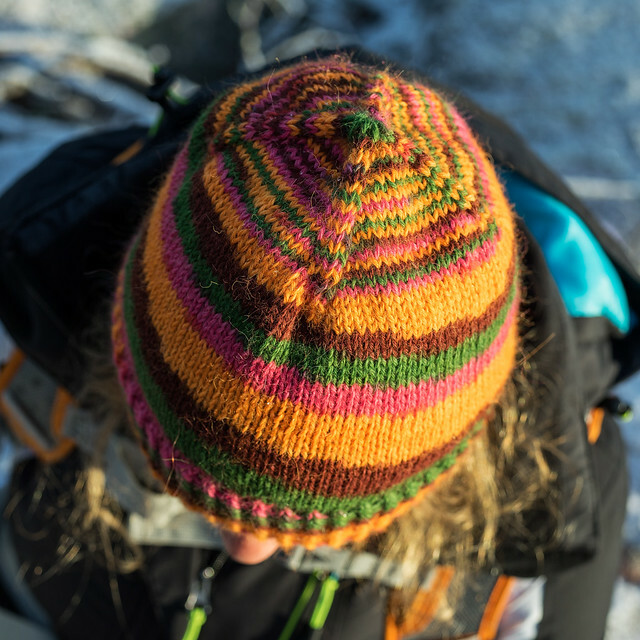 This hat was knit with double yarn, and top-down. I used 3½mm needles because I wanted the fabric to be dense. I suppose I could have knitted some interest into it but I simply wanted to see the end of this yarn, so speed was of the essence. I get a bit neurotic when I find yarn that I thought was already gone, or when I find a little bit of yarn that would just be enough for some small and quick knit. It burns a hole in my yarn stash until it’s gone. 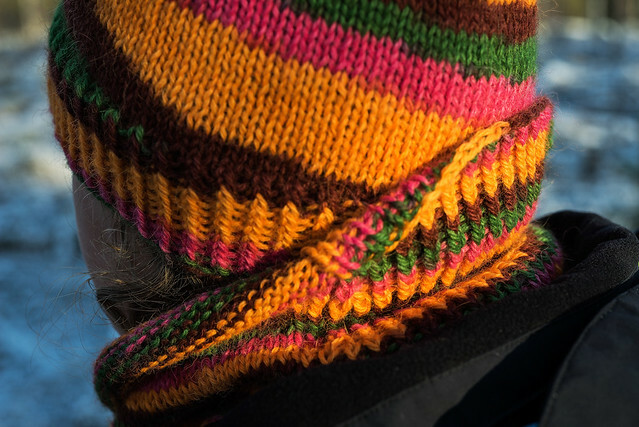 This hat was knit in one evening. Phew. I once again proved that even if I have a big yarn stash and some yarn has been sitting there for years, even decades, eventually it all gets knitted. This is one seriously frozen Chewbacca! We’ve had temperatures below -30C for over two weeks now. These temperatures are not unusual here but when they continue for weeks on end, it starts to get on my nerves. We had a mini heatwave for two days of only -10C but today we are back to -33C. We have just over 50cm of snow now. I’m not sure but I think this is little less what we normally have at this time of winter. So there’s something positive. 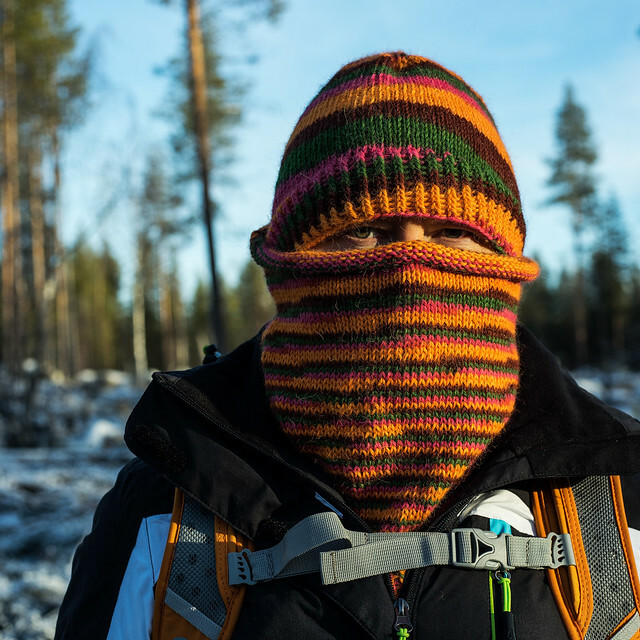 Last weekend, Sodankylä, which is the municipality where we live, broke the cold record in Finland this winter, -38.7C. It was also the coldest place in the whole of Europe, if you don’t count Russia. It is, however, business as usual here. I’ve never, ever, heard of any school ever being closed because of snow or low temperature. Buses or trains might be little delayed if tons of snow comes all at once but other than that, people just keep adding more clothes and start to look more and more like Michelin Men. The mittens above are not a recent knit. I knitted them about 10 years ago. I use them a lot. 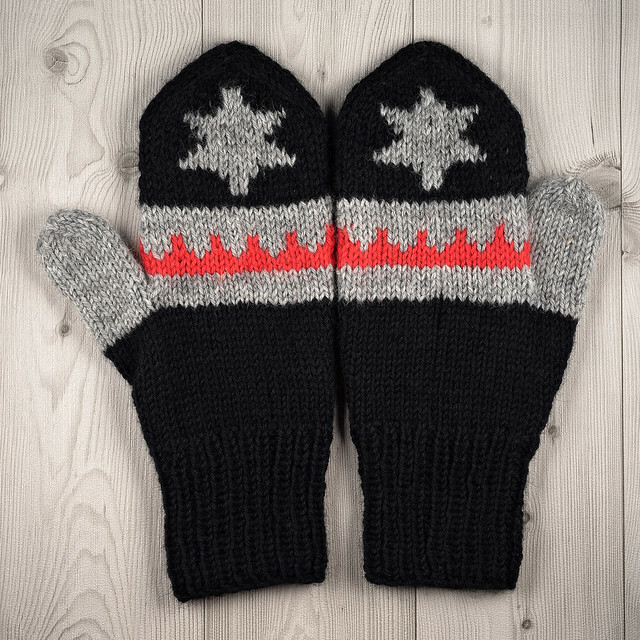 I realised that they were really warm while ploughing snow, when combined with another pair of mittens or gloves underneath. Fingers freeze really easily while ploughing snow because of the metal bar you hold on to. 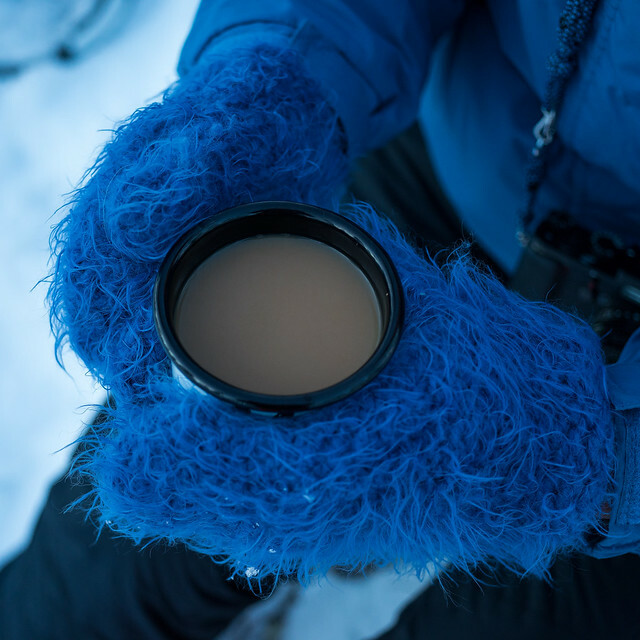 I also put the blue furry mittens in the rucksack when going on winter hikes. I like to put them on while on a break and my fingers are frozen from messing with the flask or after taking some pictures. I think it must be those fluffy hairs that make them warm, even though they are only 45% wool and the rest acrylic and polyamide. I hope you are all keeping warm, wherever you are.